Karl Wood (1888-1958) was born in King's Newton, Melbourne, Derbyshire. He later settled in Gainsborough, Lincolnshire where he was art master at Gainsborough grammar school. He had his own art studio and undertook private tuition in several subjects including painting, piano and singing lessons. Painting tuition resulted in sketching bicycle tours into Lincolnshire with his pupils. 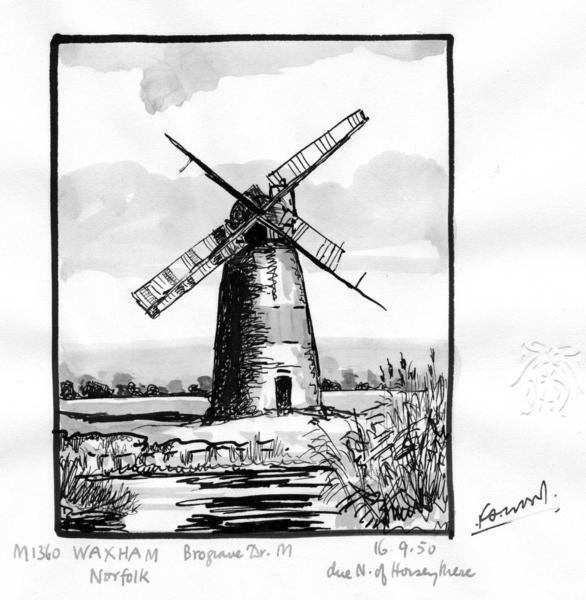 His first windmill painting was in 1926 and by 1956 he had completed 1394 windmill paintings. It was Karl Wood's intention to publish a book on British windmills to be called The Twilight of the mills, based on his extensive travels by bicycle, but this was never completed. Karl Wood's paintings are now housed in the Usher Art Gallery, Lincoln. Printed or higher resolution copies of this image can be made available, subject to a charge. Please see www.millsarchive.org/high-resolution-images for details. Alternatively, a higher resolution copy can be viewed for free at the Mills Archive; please email visitors@millsarchive.org to arrange an appointment. This image is copyright the Mills Archive Trust.